Have you ever been weeding your garden and pulled on a weed that bit back? There is a weed that looks common enough that you think nothing of trying to pull it with bare hands. The weed may not have any thorns or obvious weapons, but it does have small hairs with bulbous bases filled with irritant histamines and acetocholines. These small hairs act like miniature hypodermic needles that inject these irritating chemicals when you break the tip of the tubular hair. Intense itching and reddening follows immediately and you may think you grabbed onto a bee or wasp. The reaction usually lasts a day or two, but quick first aid may be required to calm the burning and swelling that some people experience. Wash the affected area and immediately apply baking soda paste to sooth the stinging sensation. Some people may require medical attention. This plant is a stinging nettle. Different looking than what you may have seen up north, but just as painful. The plant is an annual that comes out about this time to plague gardeners. There are two related similar-looking species found in this area, Urtica chamaedryoides and Urtica urens, but the common name around here is fire weed or burning nettle for the intense burning feeling you get from them. Some stinging nettles are used in herbal medicine and as an edible green when boiled, but not this species. The plant is usually low growing (4-20 inches tall), branching from the base, with plants growing in the shade having the longer stems. The leaves are opposite, triangular to heart-shaped in outline with coarse teeth along the edge. The flowers are not showy, just minute greenish clusters along the stem. This looks very similar to many other weeds in the garden, so it is best to wear protective gloves when weeding. Poison ivy is another dangerous weed you may encounter as you work in the landscape. Many people confuse Virginia creeper with poison ivy, but a quick count of the leaves will help with identifying the difference. 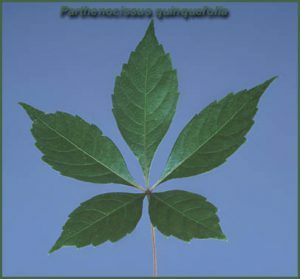 Poison ivy has three leaflets, Virginia creeper has five leaflets. They are both vines, but one is nice and once has a mean defense system. All parts of poison ivy contain urushiol, the irritating oil that is difficult to get off. Even when the vine has no leaves in the winter time, contact with the stem and roots can still affect you. The oil on your pet’s fur, your clothing, tools, shoes, or other items can cause an allergic reaction, including the smoke from burning plants. That is right – your pet may bring back more than you think from a romp in the woods. People vary in their sensitivity and may become more sensitive with repeated exposure. The itching rash, redness and swelling can last for weeks. Over-the-counter creams with bentoquatam absorb the urushiol oil and can prevent or lessen the reaction if applied before contact. After exposure your best practice is to immediately wash the exposed skin, tools, or other items with warm, soapy water and rinse thoroughly in cool water. Wash affected clothing separately from the other laundry. Minor reactions may be treated with over-the-counter products that contain zinc acetate, hydrocortisone, or zinc oxide; oatmeal baths; a paste of baking soda; or oral antihistamines. More severe reactions may require medical attention. Virginia creeper has five leaflets and is not poisonous. Gardening can be a fun, therapeutic activity, but sometimes some bad weeds get in the way. Be aware of the potential problem weeds and always wear protective gloves. Juanita Popenoe is the commercial fruit horticulture agent for Lake, Orange, and Marion Counties. She can be reached at jpopenoe@ufl.